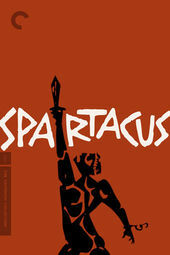 Author Pat Kirkham discusses the opening titles for Spartacus, designed by Saul and Elaine Bass, from her authoritative book Saul Bass: A Life in Film and Design. The story of a gladiator who leads a slave revolt against the might of the Roman Empire, Spartacus was a high-profile project for Kirk Douglas, who both produced and starred in the movie. A long standing admirer of Saul's work, Douglas hired him not only to create the title sequence and advertising campaign, but also as a visual consultant. His responsibilities included the design and storyboarding of the battle sequences, conceptualizing and designing the gladiatorial school and scouting the Nubian mine locations. Saul and Elaine (this was the first sequence on which Elaine was a full collaborator) wanted the titles to establish the powerful presence of the Roman Empire. "What we were going for in the Spartacus titles was the multiple layers of elegant and disdainful faces, which express the duality of Roman rule — the oppressiveness and brutality, as well as the sophistication that made possible so many contributions to Western civilization. It seems very rich to see the growth of those profiles forming a full face, and full faces dissolving into profiles before the final face starts to crack apart and the camera zooms into the empty eye, signaling that all is not well." The concept was relatively simple, but the precise effects they wanted proved difficult to achieve, especially because there were no zoom lenses available for the wide-screen Super Technirama 70 process in which the film was shot. But how to have the head crack open and retain the mood of slow decay? We had to think of a way of it coming apart slowly. We wracked our brains and Elaine came up with a great idea. She recalled the Japanese bunraku theater where puppeteers dressed in black manipulate the puppets. Well, Elaine put on a pair of black gloves and draped herself in black cloth. She was on-camera while it was rolling and slowly pulled chunks out of the statue, just taking them away slowly until it fell apart." SUPPLEMENTARY: Original Spartacus title sequence boards complete with shooting directions. Certain boards were flipped and reused throughout the sequence.